Having added my long standing project details to the reader's car section of this forum recently, I thought I'd post up for advice on the next step I am considering. 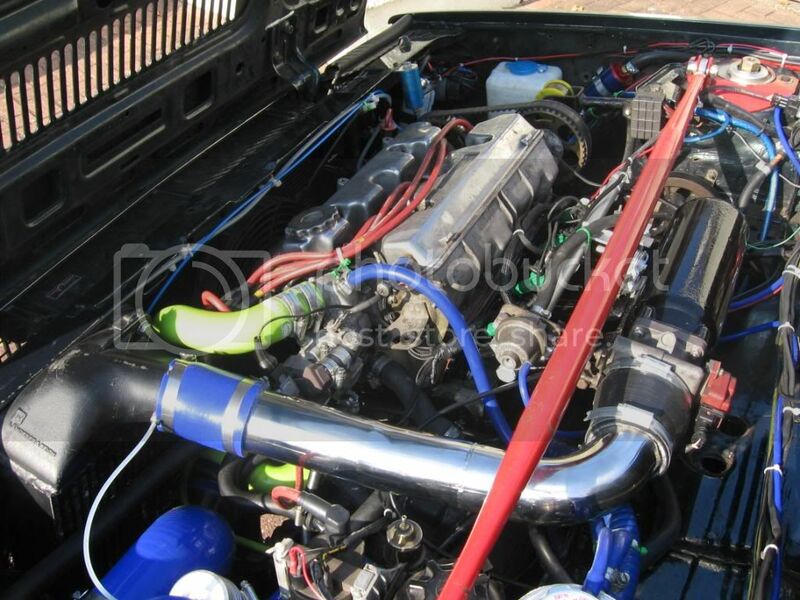 I did read Tricky's thread with a great deal of interest on designing and manufacturing an inlet manifold for a 16 valve, forced induction engine in a Delta. This thread concerns the application of a plenum to a mid engine car, which is currently normally aspirated. The engine is an 8 valve unit with a non-reversed head, ie inlet is facing towards the front of the car, exhaust to the rear. This presents a problem in that all injection applications I have come across to date are based no the reverse port design, the practicalities of which will be highlighted on the pictures. Please ignore the Monte inlet cam box with the distributor drive pocket, it's a spare head used for mocking this up. I have a Delta HF turbo ie inlet plenum (1.6) which I am using for the purpose of this post and will use if it proves to be servicable. 2. Find an inlet plenum that does not foul on the cam wheel - possibly Croma? 2. Is there an inlet plenum that does not foul on the cam wheels and will not fould the bulkhead? 4. As you can see from the pictures below, which I have added comment to, I can see a number of options but at this stage I have no idea of their merit or possibilty. Indicates the problem graphically and two issues to consider - are there any others? This shows the size of spacer required for the plenum to fit, but would mean plugging and redrilling injector pockets, which I have discounted. Also the shape of the inlet is not condusive to a smooth transition to the valve. Option - cut where marked and weld up so that plenum moves away from the cam wheel far enough for the original mounting face to cylinder head. Alternative - cut both ends off plenum, swap and reweld. Would the interior design of the plenum preclude this option? Of all options above, I think that the best would be to cut each end off the plenum and reweld so that the inlet is on the other side and the end of the plenum os then nowhere near the cam wheel. The other advantage is that by changing the throttle body to the other end, the pipework for the airfilter will have a less convoluted route. 5. I have no tooling to make a plenum from scratch, or material (although that would not present a problem sourcing), and no TIG welding equipment, even if my welding ability were up to snuff. Having one fabricated from drawings or cardboard template I think would be prohibitively expensive. Any comments, suggestions or glaring errors you can spot? Hi, I don't know much about the in's and out's of 8v OE inlets so can't offer much in that regard but, it does seem sensible to (me anyway) to keep the throttle bodies. If your engine is n/a (again not exactly my best area) are throttle bodies not regarded as the 'ultimate' setup ? Further more what strikes me is, if you are considering an upgrade to turbo or supercharger will a whole engine rethink not be needed as you will have a lot more to think about than just the intake system. have you checked the Beta ie (with the Bosch L-Jetronic) intake plenum? AFAIK that should fit directly. Check the web for pictures of Montes with it installed. tricky wrote: Hi, I don't know much about the in's and out's of 8v OE inlets so can't offer much in that regard but, it does seem sensible to (me anyway) to keep the throttle bodies. If your engine is n/a (again not exactly my best area) are throttle bodies not regarded as the 'ultimate' setup ? Further more what strikes me is, if you are considering an upgrade to turbo or supercharger will a whole engine rethink not be needed as you will have a lot more to think about than just the intake system. Thanks for the input - and it certainly would be less complicated to leave the throttle bodies for now and just look at airbox fabrication. Forced induction will almost certainly require a different spec engine, which will be plenum based, and I agree, it will require additional work in respect of the bracketry involved in mounting a charger. It's also less likely to result in the car coming off the road for a long time! I will continue working on it in the meantime though and post up results as and when. I have seen FI set ups on Montes using the Beta plenum, but they don't seem to come up for sale. The design workks well in that the inlet is to the centre of the ports, rather than at one end. Maybe I should keep an eye out to see if one becomes available. Would certainly make sense and mean a lot less work. this was not my intention, but...actually I do not need the Beta plenum anymore, so if you are interessted, send me a PM. This is a picture of the Fiat Croma inlet manifold, as you can see it is miles away from anything but will it fit in your engine bay????? Thank you 1NRO, that was my favoured option for this particular plenum. The alternative is either the Beta unit or the Croma one kindly shown in ASF72's picture below (Thanks for that!) Would you say that the top of the plenum is in line with the top of the higher cam box? I'm just thinking of possible clearance issues with the Monte. Thanks again for all of your comments, much appreciated. If you eventually want to add a turbo, one intake to consider would be the Argenta/Spider 2000 one. It has a plenum and comes over the intake camtower and the inlet points toward the back. A friend has one in his Scorpion (US version of the Montecarlo). With a 2 liter engine lid clearance is a problem, on his car the cast-in Fiat was ground off to gain a few more mm of clearance. These manifolds should be relatively cheaply available in the US.